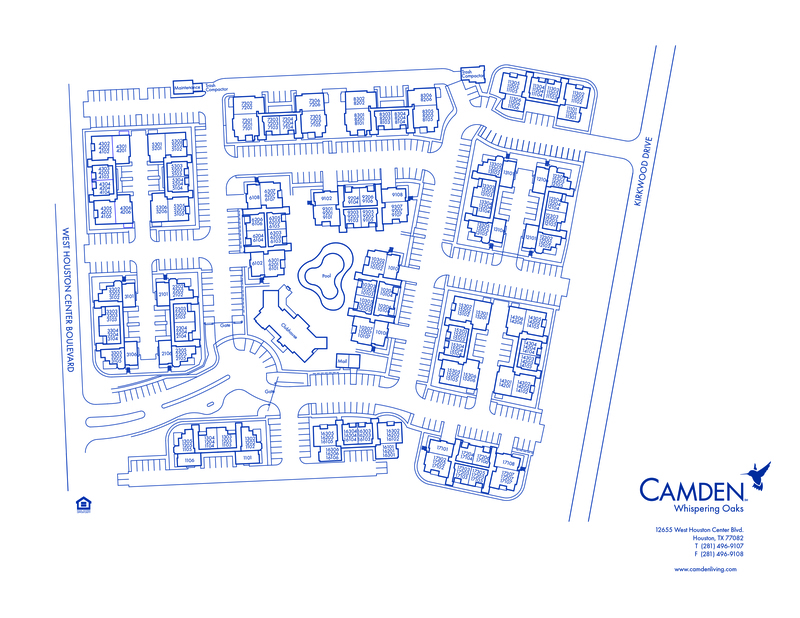 Camden Whispering Oaks defines luxury apartment living in West Houston. Our pet-friendly community features beautiful one, two and three bedroom apartments and townhomes, perfectly tucked away between Westheimer and Westpark Tollway. Our prime West Houston location lets you escape the busyness of Houston city life, and still keep the convenience of living near a large Metro. Residents are only minutes from the Galleria and Downtown destinations, with access to the Westchase District and Energy Corridor. Live less than a mile from hiking and biking at Mike Driscoll Park, as well as all the eclectic shopping and dining Westheimer has to offer. Life at Camden Whispering Oaks feels like a vacation with first-class amenities at your fingertips. Enjoy a swim in your resort-style pool, relax on the sundeck with WiFi or share a picnic with friends in the outdoor retreat complete with fireplace and kitchen. The 24-hour fitness center is always ready when you are and the entertainment lounge with billiards is only a few steps from your front door. Whether you work from home or just need a quiet place to retreat to, the 24-hour business center has comfortable seats, free Wi-Fi and complimentary printing. Each West Houston apartment and townhome includes gourmet kitchens with stainless appliances and premium cabinetry, beautiful bathrooms with garden tubs, walk-in closets, and 9-foot ceilings with crown-molding. Select two and three bedroom townhomes feature private wrap-around balconies and beautifully landscaped entrances. Other available conveniences include double vanities and attached and detached garages. Enjoy easy commutes with direct access to Westpark Tollway, Beltway 8, Highway 6, US-59 and I-10. Come home to luxury apartment living near the Westchase District at Camden Whispering Oaks. You deserve it! Interested in Houston's best 55+ apartment community located just minutes from Camden Whispering Oaks? Check out our sister community, Camden Royal Oaks! Get the perfect spot! We have ample permit parking for our residents and open guest parking for visitors on a first-come, first-served basis. Select apartment homes include garages. And garages are ready for you to rent! Attached and detached garages are available for $80 + tax per month.